A dear friend turns the big SIX OH later this week. 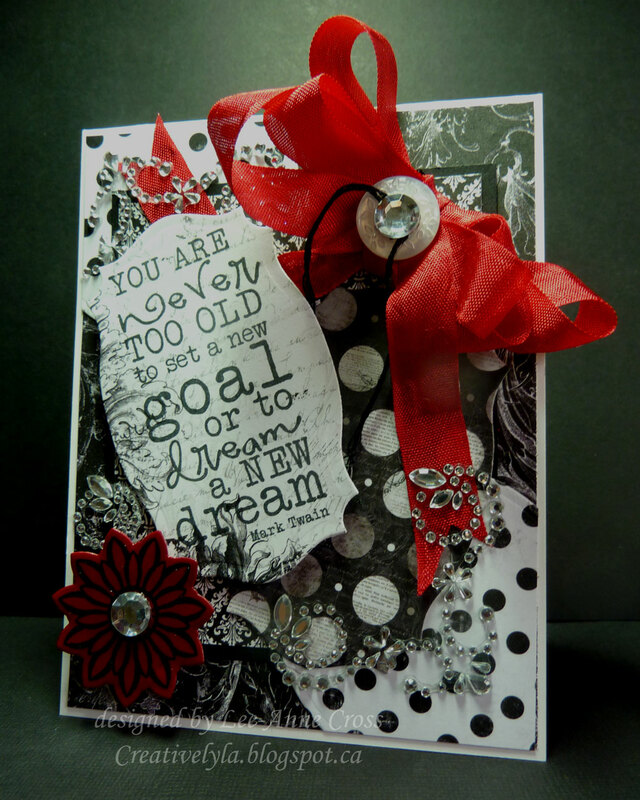 She loves classic black, white and red so that had to be the color scheme for her card. I’ve used the Splitcoast Sketch from this week for the layout. And, I have to admit when I saw the sketch…it scared me! So I pulled out some designer paper and started to play with the patterns. I’ve used a white card base and it’s been topped with a large piece of designer paper. In the corners are some circles that are actually cut off around the edges of the card. Next is a smaller rectangle of designer paper layered over some black card stock to give it a bit more presence. Then comes two die cuts…one in a larger polka dot pattern and the other a faint script and scroll pattern which seemed perfect to stamp the sentiment on. The flower has been stamped in black on red card stock and then I used two layers of Glassy Glaze to give it a plastic look. A large rhinestone was glued to the center of the flower and it’s popped up on two thick dimensionals. The ribbon is a slightly lighter shade of the same red (although the picture doesn’t really look that way!). It’s been topped with a button, some embroidery thread and another large rhinestone. I’ved added two corners of bling ’cause you just can never have too much bling right? And, after all she is celebrating 60 years of life! This card will be hand delivered in a clear box, so it has lots of height and dimension. Just fabulous! Love the classy colors and all your lovely details.